British pianist Matthew McCombie is becoming increasingly established as a versatile artist with an engaging approach to music. Matthew participates in a wide range of activities including performances as a soloist and orchestral musician, accompaniment, collaboration with composers, and educational work. As well as frequent performances in the United Kingdom, Matthew regularly travels internationally to perform across the fleets of the Cunard Line and P&O Cruises. Following an initial period of study with Tony Unwin in Cambridge Matthew went on to study with Philip Fowke and Douglas Finch at Trinity Laban Conservatoire of Music and Dance, London (formerly Trinity College of Music). Matthew graduated from Trinity Laban’s BMus Performance course with First Class Honours and was awarded the Silver Medal for his contribution to the keyboard faculty as well as being selected to represent the keyboard department in the Trinity Laban Gold Medal Showcase. Matthew continued his studies with Ruth Nye MBE at the Royal College of Music, London where he graduated from the Masters Programme in Advanced Performance with Distinction. Matthew has performed with some of the world’s leading conductors including Barry Wordsworth, James Judd and Ronald Corp and has participated in masterclasses with internationally renowned pianists such as Angela Hewitt, William Aide, Gordon Fergus-Thompson, and Peter Donohoe. 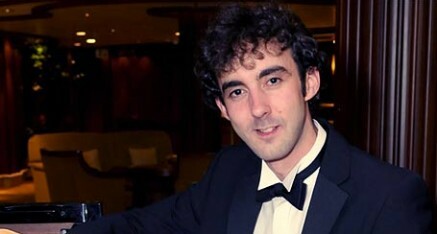 Prizes and awards which Matthew has won include the John Longmire Beethoven Competition, the Alfred Kitchen Chopin Competition, the John Halford Contemporary Music Competition, the Trinity Laban Founders’ Prize for accompaniment, and the Il Circolo Music Award from the Italian Cultural Institute, London. Matthew also plays the organ and has an interest in jazz having previously shared the piano residency at the Savoy Hotel, London.